David Powers King: Post: Turkey, Zoos, And Things That Go Boom! Post: Turkey, Zoos, And Things That Go Boom! (Note: all pictures that were taken of the event were confiscated to prevent laughing, pointing, and unwanted embarrassment). Event 2: My First BF Experience! Not sure if I'm up to do that again, but my wallet is (no, wallet - no)! Event 3: Kick'en It At The Zoo! After coming home and going to bed at 3 AM, I somehow managed to get up in the morning to visit The Hogle Zoo the next day. Pretty fun, I must day. A big section is closed for a giant exhibit they're building, but that's okay. They kidlets got to see some cool things, including a polar bear that liked to show off. And I have to tell you, there are fewer things in this world that are cuter than a "tired" baby elephant. And after that, we hit one of our favorite stores (IKEA), for some grub and a few little things. Oh, and we also stopped by the new Cabela's to redeem a promised birthday present in the form of a rugged, western-style hat. So what do you think? How's my new hat? Event 4: Read The Zombie Survival Guide in one Sitting! Because I need to research zombies (in a further extent, surviving them), I picked up this modern classic from Max Brooks. I intended to read it for my next read, but I ended up reading the entire thing. 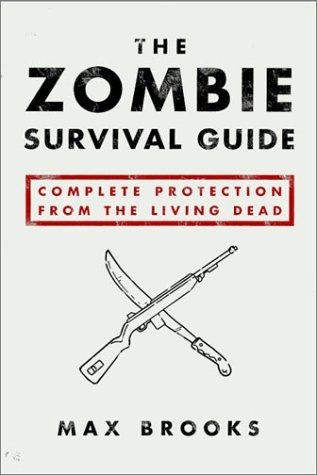 Excellent book, and not just for surviving zombies, but for general personal preparedness. I'm going to have to write a love note to this book in my current zombie WiP somehow, cause it's a life saver. I can't wait for his movie to come out! Event 5: Shooting Some Vintage Guns! In continuing my research to combat the zombie apocalypse, I've been trying out various arms from family and friends so I can get a feel for what they feel like, sound like, and smell like. With only a few hours of sleep (not the smartest thing in the world, mind you), I got to try out an 80 year old bolt-action rifle. Check out the damage I did to this old laptop hard drive from 50 yards, and without a scope (not too shabby)! Who wants me on their zombie team? Event 6: Writer Party w/Tiana and Morgan! Tiana Smith and Morgan Shamy hosted a writerly get-to-gather that went down without a hitch (and silly me, I forgot my camera, so you'll have to visit Tiana and Morgan's blogs for a visual recap of the event - you guys are posting your pics, right?). Oh, man. It was a special event. 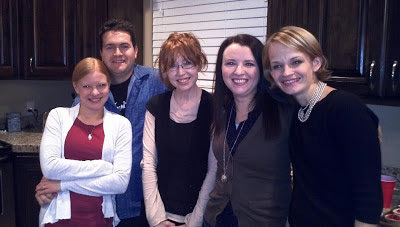 The famous Shelly and Chad were there, as well as Donna Weaver, Julia King (no relation ... I think ... but we could be CPing soon), L.T. Elliot, Carolyn Vawdrey, plus several others! Thank you again for hosting your home, Tiana (and for letting me horde the Reese's!). I lied. I stole this from Donna (don't sue me!). Being a Dad is great - not easy, but truly something I wouldn't trade. It helps having such smart and funny kidlets and an amazing best friend (aka - wifey) to share them with. I had much to be thankful for this weekend, with a lot of good things thrown at me after a string of not-so-great things, and that helps. It's a new week. The sun is out. I had pie for breakfast and I have a novel to write, so make way for a word count avalanche. It's time to bury this slippery slope! Thank you again, either in person or online, for making a difference in my life for the better. You truly get me, which means a lot, being a mixed bag of tricks. There's a special announcement this Friday, the 30th, to show my ongoing appreciation and my need to give some serious payback (no virtual crullers this time - I'm cutting back). Now let's kick some WiP ba-too-tay! Who's with me? How'd your weekend go? What'd you do? If you Black Fridayed, did you survive the fray? Did Jimmy really fall into the well? I'm David, and this house is clean! Donna and Morgan both posted photos - looked like a lot of fun. And Black Friday? Not a chance! I stayed home and shopped online. And I think anyone who goes out on Black Friday is a nutter. I avoid it like the plague. Slipping on vomit to save a few bucks? Ugh. Not my idea of fun. I'd rather pay full price!!! I'm exhausted just reading about your Thanksgiving. I've participated in every single Black Friday crazefest the last, um, 10-15 years at least. Maybe longer. This year, however, I stayed home and just had fun with the kids. It was great. No shopping at all the entire weekend. Might be my new tradition. I went to a class at a writer's conference that was all about the book, World War Z, and that trailer looks awesome. I can't wait either. David, that sounds like a power-packed Thanksgiving extended weekend! I already saw photos of your writer/dinner on Tiana's and Donna's sites. We had 18 people for T-dinner. And 17 seats at a table. Yup. We miscounted. Guess who didn't get a seat? That would be me. My only outing on Black Friday was to a reception for local authors at an indie bookstore that is, sadly, going out of business on Jan 1. It was sad, but I did meet some new people. And I slashed 12k words out of my current manuscript to meet the editor's wordcount goal. Hurray! Now I am facing a muddled outline for the rest of the books in the series, and I'm thinking I need to get back to work teaching so my subconscious can figure this out. Very disconcerting to realize I need my day job in order to make forward progress on my writing career! Catch-22. Dance dance revolution is a traditional post-turkey tradition at the inlaws, and I have the video for blackmail! I braved Black Friday too, but boycotted Walmart. Still managed to get most of what we wanted and survived. Happy writing! Sounds like you had a great, and busy, holiday! Living in a small town with a true Main Street inhabited by mom & pop shops makes "Black Friday" a fun, community affair. Little samples of hot cider, jawing with locals and spending a little more than I should to help support friends. Love it. Baby elephant pictures? So soon after Thanksgiving? Cheap shot. I don't think I'll EVER do Black Friday. Crowds are so not my thing, and I'd probably just want to smack everyone who's being mean! Happy late Thanksgiving. I went to Hogle Zoo recently. I think that zoo needs to be bigger, although a child got really testy with me when I didn't know the name of one of the walruses. He proceeded to educate me on that. I wish I could have made the potluck, but I needed to go north to the great white Idaho and spend time with mom and dad. That sounds like a really busy weekend. My holiday shopping mostly consisted of walking into Target on Friday afternoon, scooping up 5 gift cards by a register, and then checking out at said register. Took like 5 minutes. Merry Christmas! This was the first year I didn't do Black Friday. I didn't miss it at all! I'm glad you survived your first year! Thanksgiving was pretty fun for me. It was actually only my mom and I, so we went to Cracker Barrel to eat, since we didn't have to cook for a load of people. It was crowded, but the food was really good. From there we sat in Target's parking lot to get in for Black Friday. We had a really good time there, and everyone was actually very nice, other than a few random people. The employees were very helpful, too; they really had it set up well. You were busy. I was busy too but not crazy enough to try out Black Friday. I'm attacking the WIP too. Wow! Looks like you guys had a fantastic Thanksgiving weekend, so awesome. (: That trailer though, so freaked me out! As for Black Friday, we don't have that here in France. Phew! It was so fun to see you again, David, at the party Friday. For me, the idea of Black Friday is so against the whole "peace on earth, good will toward men" that I stay far, far away from it. I've worked on Black Friday for the last two years...and I end up looking like the tired elephant afterwards. To quote one of the customers I helped out the other day "Oh people be crazy." Sounds like an amazing and exhausting few days! I got stuck in Toys R Us purgatory a couple years ago with my sister-in-law, who was pregnant with twins at the time...we hid the toy we wanted behind some shelving and came back for it the next day. Glad you survived your BF experience, too! It's awesome that you got to shoot that old rifle, too. Very cool! Wow! You were a busy man! I made the same mistake on my first ever Black Friday experience. I walked into Walmart, too. I turned around and walked out. Wasn't ready yet. Seeing as I moved to a new town over the summer, I have yet to meet anyone willing to Black Friday with me, so I sat this year out. Yay for get-to-gethers especially ones that involve three Kings: Donna, you, and I! Woot! Glad you had prime holiday times.